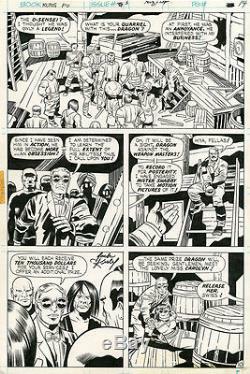 You're looking at an original piece of art by the king of comics JACK KIRBY with inks by D. Bruce Berry, from KUNG FU FIGHTER #3, page 10 (1975). This is a great page, showcasing the great style that defined Kirby for over half a century. Pen and ink on paper (10 1/2 x 16 inches), excellent condition. This page was NOT lightboxed and was pencilled by Kirby on this piece of art. All kinds of great artists here. The item "JACK KIRBY Kung Fu Fighter #3 p10 ORIGINAL COMIC ART 1975" is in sale since Monday, July 04, 2016. This item is in the category "Collectibles\Comics\Original Comic Art\Interior Pages".